Sixteen tracks from a dozen countries plus a killer bonus disc--what's not to like? Sampler albums can be tricky, but the Rough Guide series has a knack for culling good tunes from a far-flung range of material. Acoustic Africa is no different. With literally a continent's worth of choices, the selections on Acoustic Africa represent a wide range of styles and geography. From low-key guitar tunes to barn-burning dance music, this is a solid set of compelling sounds, with an outstanding bonus disc that sweetens the deal considerably. Album openers Etran Finatawa are well-known figures in the "desert blues" scene, and in fact provide the bonus disc for the Rough Guide's Desert Blues release. Their sound is dense with percussion, stringed instruments and chanted vocals, and puts the listener on notice that this is not simply going to be a record of acoustic-guitar strumming (notwithstanding the album cover, which suggests exactly that). Subsequent tunes include "Sweet Lullaby" by Madagascar native Lala Njava, a lovely song which is, in fact, a bit of guitar strumming--and a very tender bit of strumming at that--and the lilting, accordion-inflected "Mbanda Nasali Nini?" from the Republic of Congo's Syran Mbenza & Ensemble Rumba Kongo. These are just the first three tracks on the record, but already the listener is getting a sense of the variety in store. South African Zulu Shiyani Ngcobo's vibrant "Yekanini" makes effective use of a fluid, propulsive bassline and a lively counterpoint from a high-pitched African fiddle, while nimble guitar picking keeps everything moving along nicely. It's a standout tune in a record full of strong contributions, such as Monoswezi's "Ndinewe", built around the ringing tones of the mbira, a kind of finger-plucked metal harp, and soaring female vocals. The middle of the record sags a bit, with a couple of contributions that fail to stand out from this high level of accomplishment, but things pick up again with the instrumental "Crocodile Blues" by Samba Touré from Mali. A downtempo, introspective number, this is perfect music for staring out the window at the rain, and at less than four minutes it's over all too quickly. The multi-part mini-epic "Lemon Bara" from Sudan's Abdel Gadir Salim & Emmanuel Jal reminds listeners that Africa includes North Africa, which is also a source of much fine music. Gutteral Arabic vocals provide a striking change of pace from the previous songs, while the instrumentation, including oud accordion and saxophone, create a different sonic texture from what has come before. The album moves along to conclude with a number of quiet, downtempo songs in keeping with the overall tone of the collection. The real surprise here is the bonus disc from Senegalese troubadour and kora wizard Noumoucounda Cissoko. At 13 tracks, this is a generous freebie (even if four of those tracks are throwaway "interludes"), and Cissoko is no one-hit wonder either. This assortment, which consists of his solo debut album Faling, is jammed with pulsating tunes, dense arrangements, and virtuoso kora playing. "Noumou Koradioulou" trades lightning-fast kora runs with jamming percussion, snaky bass and on-target harmony vocals for a compelling ride. The thrills don't end there, either; Cissoko reels off a string of excellent, high-energy songs, including the hypnotic "Nagnou Talal Loxxo Afrique", the sweetly galloping "Dindingo a Bamah" and the bluesy, loping "Bannadenoufele". Cissoko is not merely a fine instrumentalist--his vocal range, delivery and passion are reminiscent of Salif Keita. This is no small thing, and it's easy to see why he got a whole record of his own on this compilation. 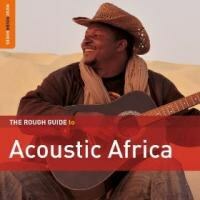 All in all, then, The Rough Guide to Acoustic Africa is a strong collection and well worth picking up, especially for interested newcomers to the scene. Even Afro-pop vets are likely to find something new here, and newcomers to Noumoucounda Cissoko, as I was, should prepare to be duly impressed. As long as the Rough Guide keeps putting out collections of this quality, let's hope they stick with it for a long time.